Thank you to The Coffee Bean & Tea Leaf® for sponsoring this conversation. Do you love a good cup of coffee? My wife and I enjoy both hot and ice blended coffees! 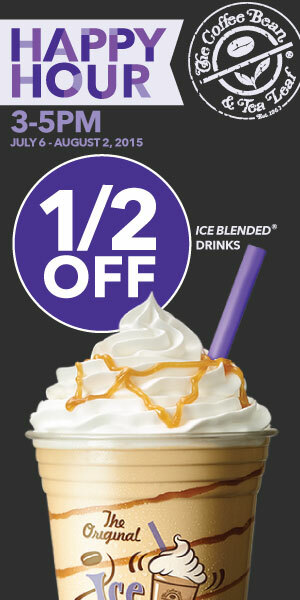 A great place to enjoy hot or ice blended coffee is at The Coffee Bean & Tea Leaf®. The Coffee Bean & Tea Leaf® has been Southern California’s iconic specialty coffee and tea retailer for more than 50 years and is keeping you cool this summer with a new Happy Hour* everyday from 3:00 pm – 5:00 pm. You can head on in and order your favorite (any size and any flavor) Ice Blended® drink for only half the price (at all participating locations). Happy Hour at The Coffee Bean & Tea Leaf® will be taking place at all participating locations in Southern and Northern California. *Offer valid only at participating The Coffee Bean & Tea Leaf® retails locations from 3:00 pm – 5:00 pm through August 2, 2015, no exceptions. Offer for fifty percent (50%) off the purchase price of any size Ice Blended® drink. Offer applies to each Ice Blended® drink purchased in a single transaction. Limit one (1) offer per customer, per transaction. Not valid on previous purchase. Cannot be used in conjunction withany other offer, promotion, or discount. No cash value. No substitutions. Norainchecks. Company reserves the right to withdraw or change the offer’s termsand conditions at any time, at its discretion, and without notice. While supplies last. Born and brewed in Southern California since 1963, The Coffee Bean & Tea Leaf is the oldest and largest privately-held specialty coffee and tea retailer in the United States. Embodying a passion for connecting loyal customers to one another with carefully handcrafted products, the company is known for sourcing and providing the finest ingredients and flavors from around the world. For more than 50 years, The Coffee Bean & Tea Leaf has demonstrated a passion for product innovation epitomized by The Original Ice Blended® drink. The company has grown to be an international icon and currently has over 1,000 stores in 25 countries. 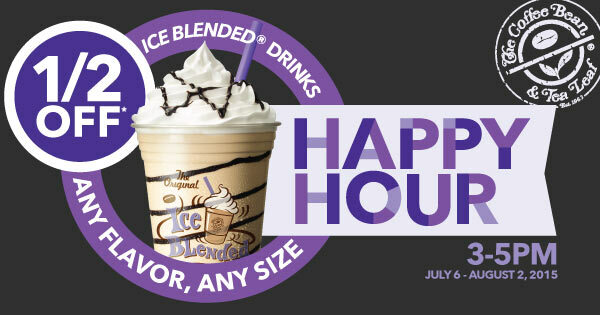 Have you stopped by The Coffee Bean & Tea Leaf to enjoy Coffee Bean Happy Hour yet?